This textbook is intended for the Principles of Management course. 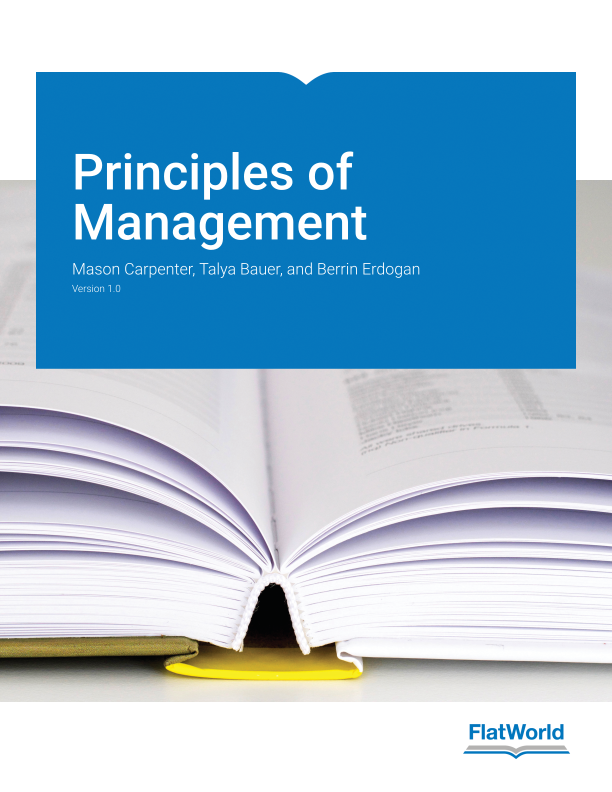 Principles of Management by Carpenter, Bauer and Erdogan teaches management principles to tomorrow’s business leaders by weaving three threads through every chapter: strategy, entrepreneurship and active leadership. Strategic — All business school teachings have some orientation toward performance and strategy and are concerned with making choices that lead to high performance. Principles of Management will frame performance using the notion of the triple bottom-line — the idea that economic performance allows individuals and organizations to perform positively in social and environmental ways as well. The triple bottom line is financial, social, and environmental performance. It is important for all students to understand the interdependence of these three facets of organizational performance. The Entrepreneurial Manager — While the ”General Management“ course at Harvard Business School was historically one of its most popular and impactful courses (pioneered in the 1960s by Joe Bower), recent Harvard MBAs did not see themselves as ”general managers.“ This course was relabeled ”The Entrepreneurial Manager“ in 2006, and has regained its title as one of the most popular courses. This reflects and underlying and growing trend that students, including the undergraduates this book targets, can see themselves as entrepreneurs and active change agents, but not just as managers. By starting fresh with an entrepreneurial/change management orientation, this text provides an exciting perspective on the art of management that students can relate to. At the same time, this perspective is as relevant to existing for-profit organizations (in the form intrapreneurship) as it is to not-for-profits and new entrepreneurial ventures. Active Leadership — Starting with the opening chapter, Principles of Management show students how leaders and leadership are essential to personal and organizational effectiveness and effective organizational change. Students are increasingly active as leaders at an early age, and are sometimes painfully aware of the leadership failings they see in public and private organizations. It is the leader and leadership that combine the principles of management (the artist’s palette, tools, and techniques) to create the art of management. Cases — Mason provides brief cases in his Instructors Manual for those who take a case approach to the course or who wish to incorporate cases. Students can read this entire textbook online, in print, and across digital devices for one low price. Teaching the principles of management course? At Flat World, faculty access college textbooks with ease and delight in how much less their students pay for etextbook, even print formats. Flat World’s online editing platform allows faculty to adopt and modify textbooks by expert authors. Brilliant. 5.2 How Do Strategies Emerge? Mason (PhD, 1997, University of Texas at Austin) was the M. Keith Weikel professor of leadership at the University of Wisconsin-Madison’s Wisconsin School of Business. His research in strategic management concerned corporate governance, top management teams, social networks, and the strategic management of global startups and was published widely in leading management and strategy journals. He was also author of numerous books used in leading undergraduate, MBA, and education courses around the world, including Principles of Management published by Flat World Knowledge. He was associate editor of the Academy of Management Review and served on the editorial board of the Strategic Management Journal. At the University of Wisconsin, he was responsible for the undergraduate, MBA, and ExecMBA courses in business, corporate, and global strategy. With others, he had also advised the top management teams and business unit leaders of Fiskars, SABMiller, GE, Harley Davidson, Rockwell International, Vivendi, Kerry Ingredients, Covance, Danisco, Badger Meter, and Banta in the areas of strategy formulation, strategy implementation, and strategic change. His teaching accomplishments included MBA Professor of the Year, notoriety as one of the two most popular professors in several BusinessWeek MBA program polls, the Larson Excellence in Teaching award from the Wisconsin School of Business, and, most recently, a Distinguished Teaching award from the University of Wisconsin-Madison. He also worked to integrate experiential and behavioral perspectives of strategic management into the classroom through positions on the BPS and SMS Executive Committees, Doctoral and New Faculty BPS consortia, and the widely-used BPS Strategy Teaching Toolkit. He passed away in 2011 and is survived by his wife and two sons. Talya Bauer (Ph.D., Purdue University) is the Cameron Professor of Management and Affiliated Professor of Psychology at Portland State University. She is an award-winning teacher and researcher and recipient of the Society for Industrial and Organizational Psychology (SIOP) Distinguished Teaching Award as well as the Academy of Management Human Resource division’s Innovations in Teaching Award. She conducts research about relationships at work throughout the employee lifecycle, including recruitment, applicant reactions to selection, onboarding, and leadership. Her work has been supported by grants from the National Science Foundation (NSF) and the National Institutes of Health (NIH) as well as the SHRM and SIOP foundations and has been published in research outlets such as the Academy of Management Journal, Academy of Management Learning and Education Journal, Journal of Applied Psychology, Journal of Management, and Personnel Psychology. She has worked with dozens of government, Fortune 1000, and start-up organizations and has been a Visiting Scholar in France, Singapore, Spain, the UK, and at Google Headquarters and she has delivered keynote addresses in Australia, Greece, Spain, the UK, and the United States. She has served in elected positions including the HRM Executive Committee of the Academy of Management and Member-at-Large for SIOP. In 2018-2019 she served SIOP as its president. She is an associate editor for the Journal of Applied Psychology (and the former editor of Journal of Management). Her work has been discussed in BusinessWeek, Harvard Business Review, the New York Times, USA Today, Wall Street Journal, and NPR’s All Things Considered. She is a fellow of SIOP, the American Psychological Association, Association for Psychological Science, and International Association of Applied Psychology. Berrin Erdogan (Ph.D., University of Illinois at Chicago) is the Express Employment Professionals Professor of Management and Affiliated Professor of Psychology at Portland State University. Berrin’s research focuses on two themes. First, she examines how leaders lead through the relationships they build with their employees, and the implications of manager-employee relationships for employee effectiveness, retention, and well-being. Second, she is interested in understanding person-job fit and misfit, with a focus on why and how employees find themselves overqualified for their jobs and the consequences of being overqualified. She conducted studies and shared results with organizations in manufacturing, retail, healthcare, education, information technology, construction, and banking among others, in the USA, UK, China, Turkey, Vietnam, France, and India. To date, she has published over 60 journal articles and book chapters, co-authored the textbooks “Organizational Behavior” and “Principles of Management” published by FlatWorld, “Psychology and Work” published by Routledge, and co-edited the Oxford Handbook of Leader-Member Exchange, published by Oxford University Press. Her work has been discussed in media outlets including the New York Times, Harvard Business Review, CNBC, BBC Capital, and Wall Street Journal, among others. In 2013, she was elected a fellow of Society for Industrial and Organizational Psychology (SIOP) for unique and unusual contributions to the field of Industrial Psychology. She served as an associate editor for European Journal of Work and Organizational Psychology and Personnel Psychology. Berrin is a frequent speaker at national and international conferences and served as a visiting scholar and gave invited talks in Australia, Canada, Greece, Iceland, Singapore, Spain, Turkey, UK, and the USA.